We have a wide range of Platinum Cured Silicone Hoses braided or reinforced with different type of reinforcement. 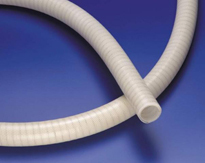 The hoses are designed to meet the highest standards of reliability and quality. A full traceability is available for the hoses and each type of hose is available with a certificate of FDA and USP Class VI conformity. The common ends connection will be tri-clamp. 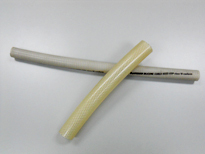 Our PTFE hoses are available with advantages of both convoluted and smoothbore designs. The product which is sufficiently flexible, like convoluted, yet retains the advantages offered by smoothbore, like fast flow rate and cleanability. The hose is the PTFE liner design, which comprises integral rib sections which support the tube against kinking, vacuum and pressure, and highly compressed web sections which give a smoothbore inner surface and excellent flexibility. Another feature is the integral PTFE lined and flared end fitting design. Safe guard for the external are also available.